Explorations and Experiments in the Kitchen. Improvised Easy Recipes and a Love of Healthy Eating. It’s been a busy week for me and I’ve pulled a few late nights at work, which means I haven’t been cooking and as a result, I’ve not been eating quite as healthy as I’d like to. I realized as I was scrummaging through my refrigerator this morning that I haven’t been grocery shopping in almost two weeks and any produce left in my fridge was just about at the point of needing to be cooked or tossed within a couple more days. I decided that tonight I’d make a nice vegetable soup from all the remaining produce that I have. I realized I had no onions or broth, but decided it might be fun to experiment anyway. It really doesn’t matter if the produce isn’t in its freshest state. It’s going into a soup, as long as it’s still okay to eat, it’s okay to put in there. I started off with the carrots thinking they’d take longest to cook. 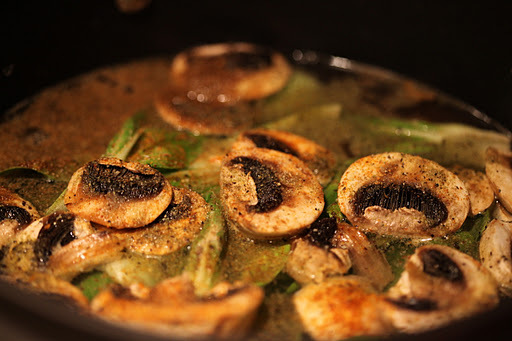 Following that, I added the asparagus, and then the mushrooms and bok choy. I added some of my usual spices: garlic salt, cumin, coriander, salt, pepper, Cavenders, and even a touch of hot sesame oil. I thought it might add a little nutty flavor to the soup. I let it all simmer while covered to soak in the flavors and cook through the carrots. 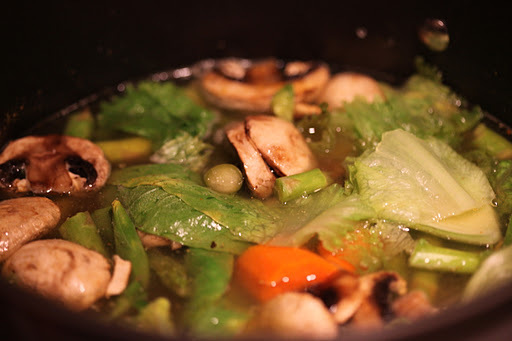 After about 10 minutes, I added the romaine lettuce and started tasting the broth. It wasn’t quite right for a while, and I am sure it’ll be best the next day upon letting the flavors sort of congeal a bit. Right away, I added quite a bit more salt for flavoring, and even a touch of soy sauce. 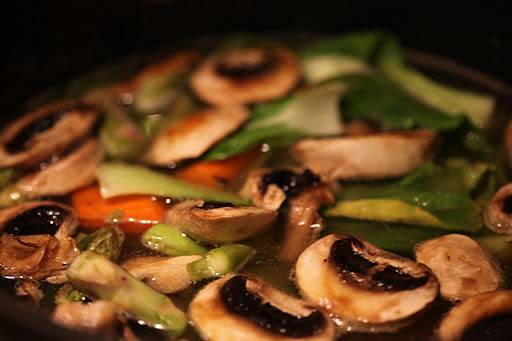 If I cook this one again (which I’m sure I will), I might have to try sauteing the vegetables first with a little garlic and olive oil prior to adding them to the soup. 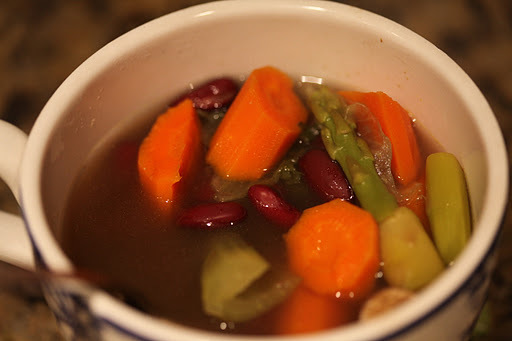 At the last few minutes on the stove, I decided to add a can of red kidney beans to help give the soup a bit more girth. I like a good hearty soup, and short of adding some orzo in here, I didn’t have much else. The nice thing about this meal is it’s an easy way to finish off produce altogether and quickly, and can pretty much take anything. If I had some, I would have definitely added onions, zucchini, bell peppers, celery, cauliflower, or anything else. In less than 30 minutes between preparation and cooking, I was able to use up every last bit of produce and cook myself a tasty, light soup that I will certainly enjoy over this cool, rainy weekend. ← Baby Bok Choy with Fish.